In 2003-2004‚ MF Doom was so prolific he needed several names to record under. Breaking years of silence‚ DOOM (he insists it be capitalized) reemerges on Born Like This‚ ready to prove that it was only "MF" he lost‚ not his genius. Opener "Gazzillion Ear" is classic DOOM‚ filled with references from all aspects of pop culture--Ernest Goes To Camp‚ professional wrestlers on mescaline‚ and the hadron collider for example. He jumps from hyper-speed rhymes to a gravelly drawl‚ making "Gazzillion" sound like a duet between two different versions of himself. No stranger to multiple personalities‚ DOOM (a.k.a. Zev Love X‚ King Geedorah‚ Viktor Vaughn‚ etc.) utilizes his schizo-phonic tendencies successfully on the track‚ but the countless ideas on Born aren't always developed enough to reach full potential‚ which prevents the album from fully meshing. 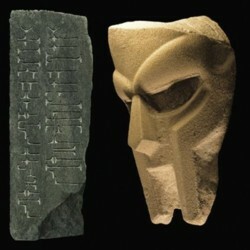 On the plus side‚ DOOM's tracks benefit from some of the most innovative beats in hip-hop. Rather than a simple bass and drum loop‚ "Lightworks" sounds like DOOM is rapping inside a high-speed underwater elevator. Unfortunately‚ it's followed by "Batty Boyz‚" which finds the self-proclaimed super villain lampooning superheroes as homosexuals. In "Boyz‚" DOOM beats a dead metaphorical horse‚ when he could've left it at "Batman head bobbin'‚ slobbin' robin's knob." I would say it's too sophomoric for DOOM's standards‚ but his last album was about cartoons so what do I know? DOOM's skill is present‚ but diluted by a slew of guests. His friends have talent‚ but after years of inactivity‚ I'd rather hear an entire album of him‚ not DOOM & PALZ. Cameos by Wu Tang legends Ghostface and Raekwon aren't even an exception‚ with the only great feature of the album coming from the late‚ great Bukowski‚ who reads an excerpt of his poetry on "Cellz" before DOOM brings his own brand. Although it isn't perfect‚ Born is a welcomed return for DOOM. It's not flawless from start to stop‚ but there are enough moments of greatness to validate the missteps. To paraphrase his own words‚ he's still the bees knees (for sheez).